This is Dallas, and aside from big hair, sloppy football franchises, and Tex-Mex, what else do we have to offer? Barbecue, of course, that time-worn culinary tradition of slow-cooking meat in a smoker till it falls off the proverbial bone. While brisket is still the item upon which ’cue joints are judged, it isn’t the only meat to drool over: house-made sausage, turkey, chicken, and ribs, as well as less common options like quail, prime rib, and beef shoulder pop up on menus all the time. 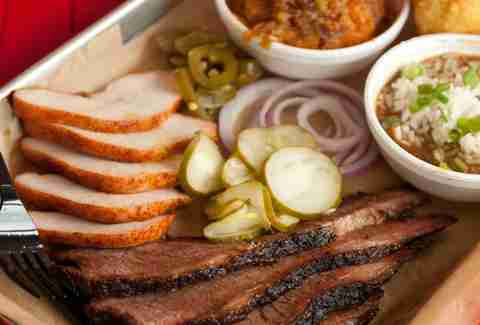 And if the meats make the smokehouse, then fantastic sides bring it to the next level, and Dallas has certainly upped its game with chef-y dishes that go beyond cole slaw and sweet beans. 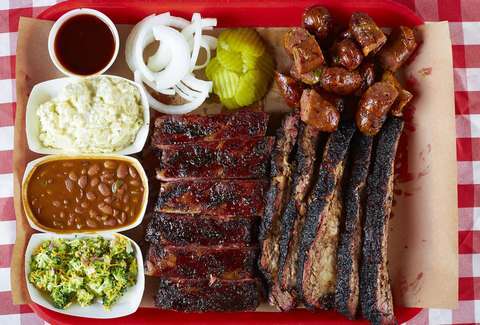 Here are 11 fine spots to get some barbecue in your belly in and around Dallas. Probably the biggest challenge for barbecue lovers is finding one place that does all the major meats -- brisket, ribs, pulled pork, chicken -- really well, and this north-of-Dallas outpost definitely does. The USDA prime brisket boasts the perfect fat-to-meat ratio, as well as great char; ribs are beyond fork-tender; pulled pork is smoky with nary a dry shred; and bone-in chicken should bring back childhood memories of dad at the grill. With two barbecue sauces to choose from -- one sweet, one more vinegar-y -- classic sides like slaw, beans, and potato salad, as well as the best yeast rolls this side of Central Expressway, Ten50 makes for a terrific go-to ’cue joint. For a taste of Kansas City-style barbecue, look no further than this newbie on the scene, from a pitmaster who honed his craft in Missouri. At this casually upscale restaurant, the menu is split between Modern ’Que -- pit-fired oysters, smoked wings, salmon, grouper -- and Classic ’Que, brisket, sausage, chicken, pulled pork, and ribs, but also an awfully modern-sounding smoked cauliflower steak. Sides are elevated, too, from pit-roasted mushrooms to apple cider slaw, and the craft cocktail game is strong. The exurbs aren’t too shabby when it comes to the barbecue game, as this comfortable smokehouse showed when it opened in 2013. Starters like brisket-loaded queso, smoked wings, and jalapeño fire crackers became instant classics, and the burnt ends, baby backs, and black pepper sausage keep traditionalists coming back. Don’t overlook the pizzas here, either: They’re still on the menu for a reason -- they’re pretty damn good, especially the sauce-and-brisket-studded Smokehouse pie. Is it the scarcity that makes this spot so hot? Meats sell out pretty much daily, and the tiny window of the day that it’s open (11am to 3pm daily) give The Slow Bone the caché of a rare gem. It helps that the food is all kinds of excellent, too. Your favorites like brisket, chicken, and ribs are on offer, but regulars also rave about the smoked cilantro sausage, too -- and when’s the last time you could order a tamale with your brisket? Unique sides are a high note here, from Brussels sprouts and cauliflower gratin and pea salad to fried okra and sweet potato casserole. The father-and-son team behind this restaurant right near South Side on Lamar turns out beautiful pecan-smoked meats, including pulled pork, baby back ribs, and beef sausage, as well as some great sides like an addictive cole slaw kicked up with bacon and blue cheese, and a right proper Southern potato salad. And keep this in mind at the most wonderful of the year (for eating): Off the Bone sells Cajun fried turkeys for those not quite willing to risk life and limb to DIY that stuff. No list featuring houses of barbecue worship can forget Pecan Lodge, the much-lauded smokehouse that quickly outgrew its farmers market digs and set roots down in Deep Ellum. Sure, there’s still a line out the doors most days, but at least there are more places to sit and breathe in that smoky air while you knock back 1lb beef ribs, some of the best brisket in town, or hand-cranked sausages. If you’re not up for a two- or three-meat plate, an overstuffed brisket-topped sweet potato or crisp fried chicken is yours for the taking. Honored in books and magazines as being part of the stratosphere of local barbecue joints, this family-owned chainlet slow-smokes meat over pecan and oak 24/7. 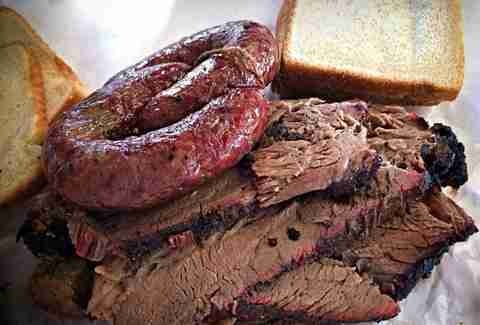 It’s unfairly located in the Dallas exurbs, but the drive is most certainly worth it once you dig into the spicy hot links, the brisket-stuffed jalapeños, and the brisket. If you’re jonesing for a little seafood to break up the meat-otony, Hutchins also serves a killer fried catfish. 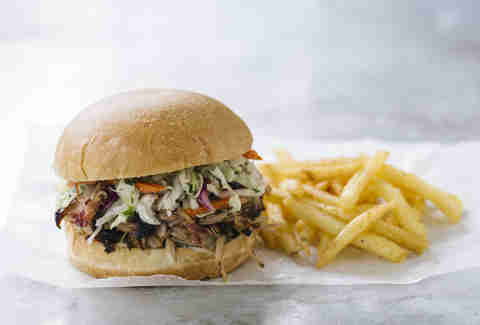 This spot is almost as popular for what it does with its smoked meats as for just serving them classic-like on a plate. Think smoked stuffed quail -- or bacon-wrapped quail, when it’s on hand -- BBQ Frito pie, and the most-renowned side hustle of the smoked meats: the Monster BBQ Baked Potato. That’s a regular loaded baked potato topped with any boneless meat, and barbecue sauce. It’s as big as your face and a friend’s, and we hear if you can polish it off, you’re good till the next day’s lunch. The fandom was so intense for this Oak Cliff BBQ joint that it spawned an offshoot in Plano’s historic downtown. 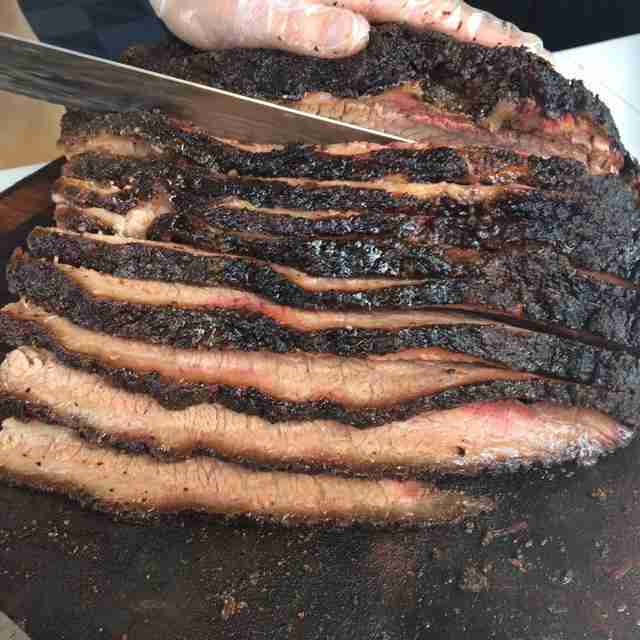 Folks are crazy over the Central Texas stylings, including an insistence on throwing down on brisket, chicken, house-made sausage, and famed prime rib sans fork or barbecue sauce (for a while, Lockhart didn’t offer either! 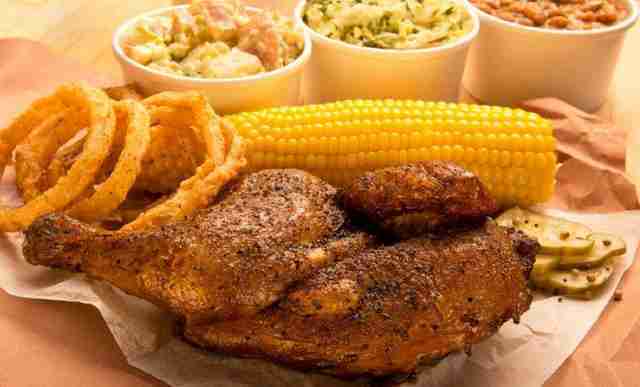 ), the better to enjoy the zesty rub. Sides are big here, too, most famously smoked potato salad and a rotating slate of deviled eggs. If you’ve ever harbored an albeit totally random craving for Cajun food and barbecue, this underrated gem straight outta New Orleans is your new jam. Not only can you procure brisket, jerk chicken, and incredibly tender pulled pork that’s smoked here daily, but you can have it all with a side of fried shrimp po-boy, fried catfish, and jambalaya; they even mix genres, offering barbecue po-boys. If there’s room behind your belt after all that, remember to have a cornbread muffin or two, then dive in to the sweet, slightly sour beignets for dessert. 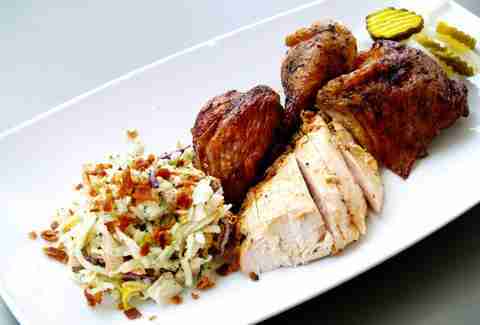 This elevated Plano ‘cue joint comes with an outstanding pedigree: it’s the brainchild of local celeb chef Kent Rathbun. 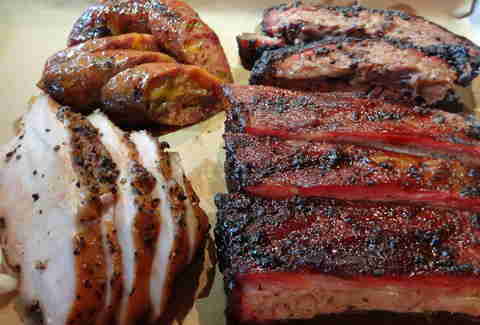 His menu shows off some unique cuts and presentations, including a smoked pepper-crusted USDA Prime brisket and roti pork shoulder with a mustard-brown sugar glaze. The other specialty here is burgers, from a classic on a brioche bun to a spicy one topped with burnt ends chili. Expect rich and decadent sides as well as a terrific craft cocktail program. Calling themselves purveyors of “farm-to-smoker craft barbecue,” a young husband and wife duo is behind this insanely popular food truck and catering company that has foodies lining up for tender brisket, ribs and sausage. That rabid following has fueled Heim’s current efforts to build its first bricks-and-mortar site, which, as of late last year, was still under construction. Keep an eye (and a nose) out for this one. Farah Fleurima is a Dallas-based freelance writer and editor who prefers the fatty end of the brisket. Follow her foodie musings at her blog The Dallas Diva and on Twitter at @TheDallasDiva.